What is fibroid and how common it is? Uterine fibroids are common non-cancerous (benign) growths that develop in the muscular wall of the uterus. Fibroids are the most common tumours of the uterus, fibroids are also called leiomyoma, leiomyomata, myoma and fibromyoma. How will I know that I have fibroids? Most fibroids do not cause symptoms. Only 10 to 20 % of women who have fibroids require treatment. If you are suffering from any of these symptoms consult your gynaecologist, on examination or by ultrasonography we will be able diagnose fibroids . What is the cause of fibroid, can I avoid getting fibroids? Unfortunately, because the cause of the tumors is not known exactely, there is no way to prevent the onset of uterine fibroids. If a woman falls into any one of the categories that make her most at risk, she should be checked for fibroids at each visit to her doctor. Treatment options for fibroid uterus? Many women with uterine fibroids experience no signs or symptoms, or only mild signs and symptoms. Observation with sonography at routine intervals is the best option. Medications for uterine fibroids target hormones that regulate your menstrual cycle, treating symptoms such as heavy menstrual bleeding and pelvic pressure. They don’t eliminate fibroids, but may shrink them . Medications include includes mainly hormones. A noninvasive treatment option for uterine fibroids that preserves your uterus, no cuts and is done on an outpatient basis. Done inside an MRI scanner done with a high-energy ultrasound transducer for treatment. After localisingthe fibroid, the ultrasound transducer focuses sound waves into the fibroid to heat and destroy small areas of fibroid tissue. Uterine artery embolization. Small particles are injected into the arteries supplying the uterus, cutting off blood flow to fibroids, causing them to shrink and die. This technique can be effective in shrinking fibroids and relieving the symptoms they cause. Complications may occur if the blood supply to your ovaries or other organs is compromised. Laparoscopic myomectomy.Done in young patients and in those who wants to preserve uterus for future pregnancy. 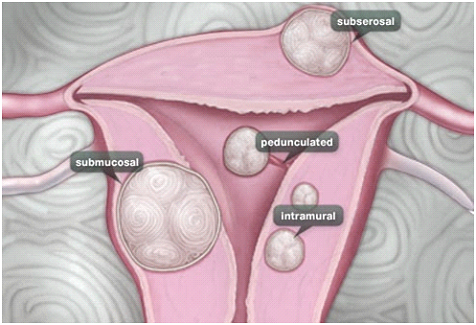 In a myomectomy, surgeon removes the fibroids, leaving the uterus in place. With advancing technology, we are now able to remove multiple and huge fibroids laparoscopically. Laparoscopic Hysterectomy. For those who have completed the family and old patients. Risk of developing new fibroids? For all procedures, except hysterectomy, small microscopic fibroids doesn’t detect during surgery can eventually grow and cause symptoms that warrant treatment. This is often termed the recurrence rate. Those with single fibroid recurrence risk is low when compared to multiple fibroids. Some research has shown 5-30% recurrence over 5-10 years.